So here is a little summary of what I've done these past few days. 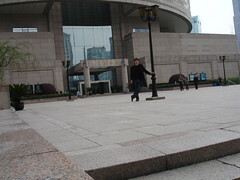 On Monday I visited the Shanghai Museum. The place is quite big and thus I spent a lot of time in there. Exhibitions were: Chinese's Bronze Age, Chinese's Ancient Sculpture, Chinese's Ancient Pottery and Porcelain, Chinese's ethnics and traditional culture, Chinese's Currency, Chinese's Painting and Calligraphy and Chinese's Jade Treasures. The next day - yesterday - I did nothing of much interest since it was raining the whole day. 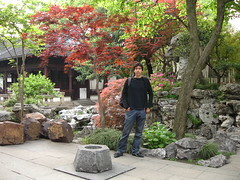 The sun was back today, so I spent some time in the old town area of Shanghai and then visited the Yuyuan garden. This Ming dynasty's garden was beautiful (look at the photos), but was way too crowded to really enjoy anything. 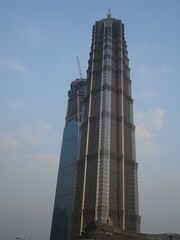 I then took the Bund tunnel to cross the Hangpu river and I went to the Jinmao tower's last floor, 420 meters above the ground, to have a great overview on the whole city. I suppose these pearls must not worth much but nonetheless, it's great! The Internet connection here is not very steady so it's a PITA to upload anything. Well, maybe that's because I'm (running) out of servers? And the places around Yuyuan is the famous place of shanghai food.